I wasn't sure about the Stamp of the Month -- the main flower is really big for cards. 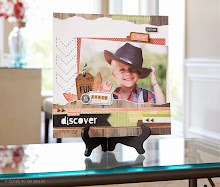 It's perfect for making a background pattern on a 12x12 sheet of paper for scrapbooking though! I did a couple. I especially liked it with white embossing powder on Spring Iris paper. 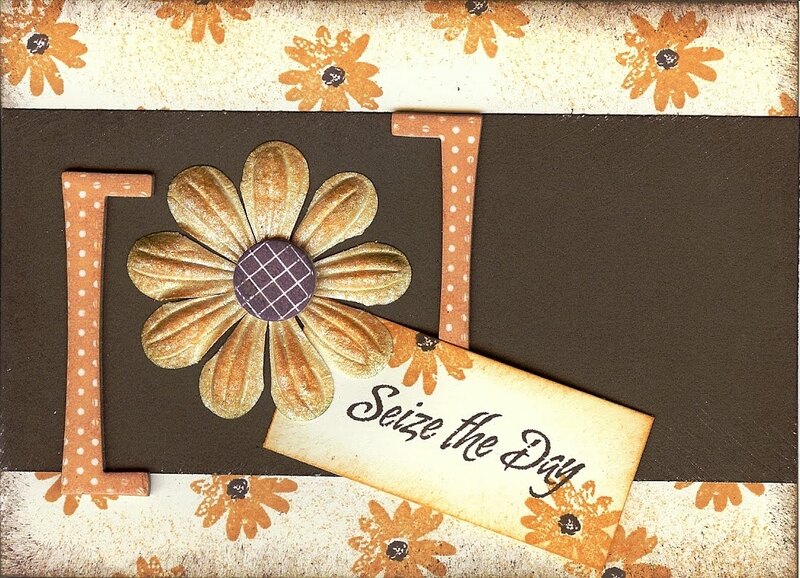 For this card I used Goldrush ink and the small flower in the stamp set. One of the things I really liked was the center of the flower DID NOT exactly match the shape of the hole in the flower. The hole is square, the dot is circular. It made it look more natural. I like that. I used Cocoa Ink for the center. 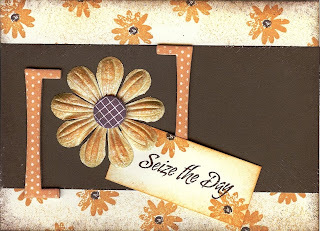 On the card, I used a White Daisy Just Bloom and sponged it with Goldrush Ink. Then I spritzed it with home made Glimmer Mist (recipe follows). I also used the Pizzazz Irresistibles. Put the liquids into the bottle and shake well. Add more reinker as you like. You can spray the mist on paper, flowers, whatever. The rubbing alcohol makes it dry quickly, the Create A Shade makes it shiny, the reinker gives it color. Experiment with different colors/combinations of reinkers. If you keep the bottle farther away from your project, you with get a lighter, subtler coverage. The closer you are, the more big blobs of mist you will get. I like holding the bottle about 2 feet away from the paper. Use a newspaper to cover your table. $2, $4, $6, $8 - Who do we appreciate? YOU!